What do you get when you combine ultra soft organic cotton with stretchy wings and a side snap design? The PERFECT diaper!! Use snap in soaker for older babies or heavy wetters. When soiled start fresh with a new diaper. The stretch side panels and cotton inner make this an ideal first trainer!! Wash hot with detergent and tumble dry 5-6 times before use. They will continue to gain more absorbency as you wash them. 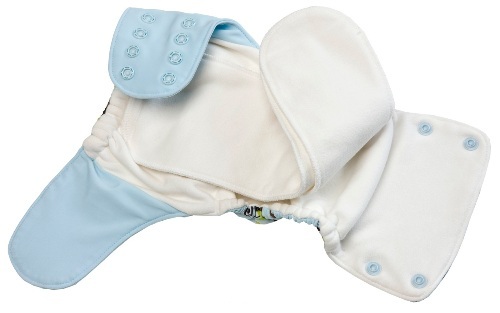 Great absorbent slim fit nappy. GroVia AIO is the trimmest Cloth Diaper ever. Simply love them and this print is so fun. I've tried almost every type of diaper you can think of--prefolds, flats, all-in-twos, a dozen different brands of pocket diapers, even other brands of AIOs. GroVia OS AIO wins hands down! They're made of super soft organic cotton, they never leak, they dry quickly, I love the prints, and best of all NO MORE STUFFING POCKET DIAPERS! :) I HIGHLY recommend these to anyone interested in cloth diapering!